Sengoku period (戦国時代, Sengoku jidai) or "Warring States period" in Japanese history was a time in which there was little social or policital stability. There was nearly constant military conflict which started in the middle of the 15th century and ended at the end of the 16th century. The name "Sengoku" was adopted by Japanese historians. The Sengoku period in Japan mirrors the Warring States period in Chinese history. The Sengoku period would precede a process of unification and the end of Japan's medieval period. Three important and powerful daimyo were Oda Nobunaga, Toyotomi Hideyoshi, and Tokugawa Ieyasu. These three leaders did the most to bring Japan together as one country. Other important leaders include Date Masamune and Akechi Mitsuhide. ↑ 1.0 1.1 Nussbaum, Louis-Frédéric. (2005). 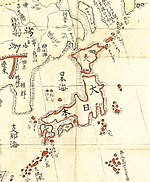 "Sengoku-jidai" in Japan encyclopedia, pp. 841-842. ↑ Jansen, Marius B. (2002). The Making of Modern Japan, p. 5.